Pushing out content in the digital world is no longer enough… the content you create must have meaning and relevance for your intended audience. Unfortunately this is not always the case. With complex sales cycles often extending into years, maintaining long-term relevance requires both strategic planning and dynamic adaptability. 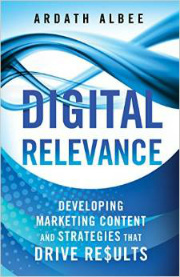 Digital Relevance provides the techniques and advice marketers need to match content to context and respond to constantly shifting markets. A comprehensive guide to help marketers use content marketing to drive decisions to buy in their favor. In the highly lucrative B2B complex sale, marketers are increasingly being pressured to deliver results during the lengthy sales process. 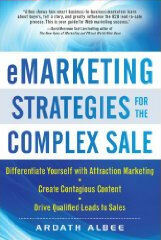 eMarketing Strategies for the Complex Sale is the first book designed to answer this challenge. Ardath Albee explains how to create and use online content and communication strategies to catch and hold the attention of busy prospects to the degree of engagement necessary for sales readiness. Build a foundation for eMarketing strategies based on buyer perspectives. Use a buyer synopsis to develop personalized content. Transform prospect engagement with natural nurturing. Create a contagious content structure for competitive differentiation. Generate increased pipeline with attraction marketing. Facilitate faster prospect progression to sales readiness. Perfect the transition of sales-ready leads to your sales force. Measure the impact of eMarketing programs against business objectives. You’ve heard repeatedly that content must be relevant to engage prospects. This book shows you just what that means. Your prospects want valuable information and expertise that shows vendors understand the issues they’re facing and specialize in helping companies like them successfully resolve those issues. Establishing strong connections with prospects across their purchasing process is the prerequisite for increasing the number of buying decisions made in your company’s favor. This isn’t just a book with high-level thinking. It’s chock full of examples, tools and exercises to help business-to-business marketers translate the strategy into practice to achieve dramatic results. After all, an eMarketing strategy goes far beyond simply distributing your content on the Web.